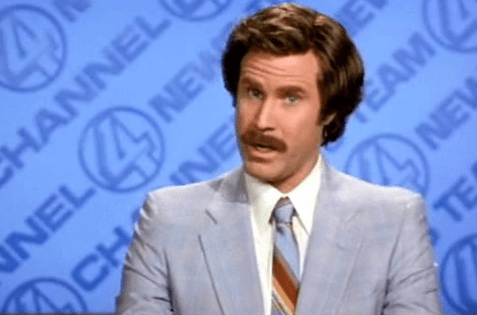 The Anchorman Suit in Stunning Red, why Rupert The Tailor can help. 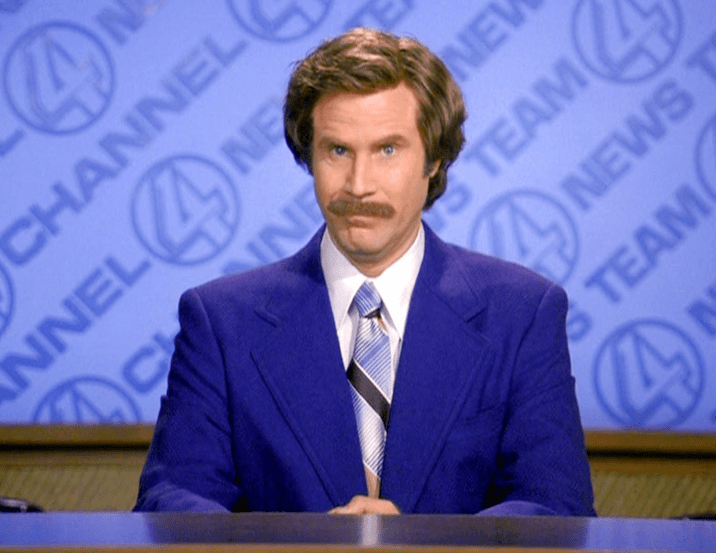 Ron Burgundy is a style icon, not because of his amazing hair and traditional mustache, but for the flamboyant colours he displays through his clothing choices. 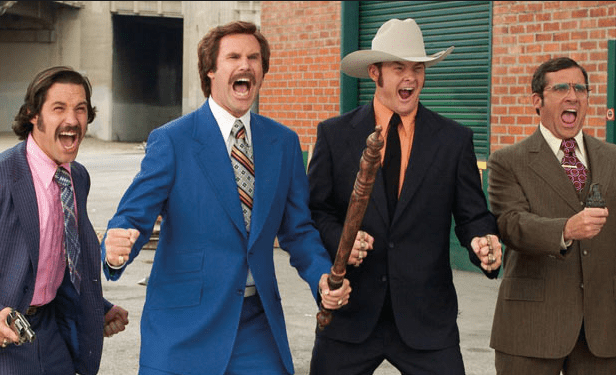 Now any fan of Anchorman will know about the Red, Blue and Brown Suits, those who have never seen the film, well firstly you NEED to watch this masterpiece, secondly take a look at the images below and you will know what we mean by style icon!! From the films and images we can see that Ron goes for the traditional 2 button single breasted suit, with 2 front flap pockets and a standard breast pocket. The bold blue suit has pick stitching around the edges of the lapels, and the red suit has different cuff buttons, with a fold over flap and button rather than the standard cuff buttons. 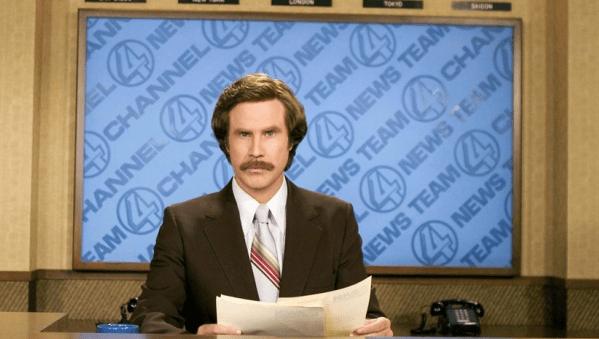 The hype around the 2nd Anchorman film has been heightened by the Red Suit once again making an appearance in the Official Trailer as well as the brand new 70+ adverts for the US Dodge Durango. But there has been a change! The addition of a matching 5 button waistcoat! Not only does this add another classic dimension to the already eye catching suit, but it makes it classier and more sophisticated. 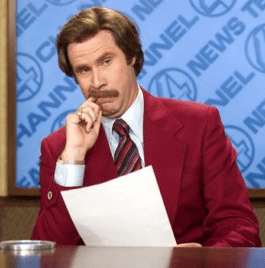 Have you ever wanted to be a little like Ron Burgundy, have a suit in pale blue, red, burgundy or brown to be a bit different from the rest of the crowd. Or do you want another colour all together and make a statement in purple, yellow or pink? Finding these on the high street is nearly impossible, but here at Rupert The Tailor we have every colour under the sun, with over 100 to choose from we can make you the perfect Anchorman Suit. If you want the same as Ron with buttons and individually buttoned cuffs, that’s fine. If you want pale blue with flap pockets, no problem. If you want something entirely different, just come to us. We can make anything you want, in any style and any colour. We have FREE swatches available on the site of all the materials, so you can see and feel before you buy. 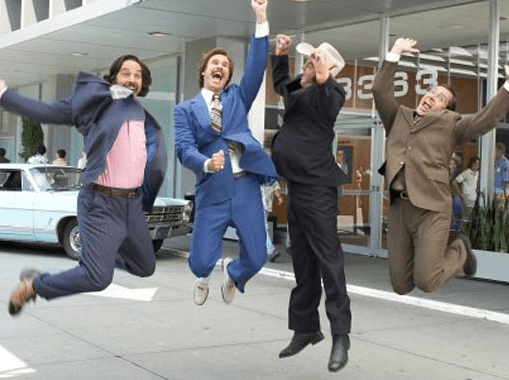 The quick and simple online ordering system makes getting your favourite Anchorman suit easy, just follow the instructions and personalisations and have your suit with you within 4 weeks from ordering. Not only is it simple its also QUICK. Dont forget to take a look at our Facebook Page, Twitter Account and Pinterest Board, where we have posts, more blogs and photos of some of our other fantastic suits including the soon to come, Zoot Suit and Frock Coats. Previous PostPrevious Rupert The Tailor’s Purple Suit Hits The Stage with the Funny Fokkers!